QWE March 13 2002© 2002 The authors, all rights reserved. 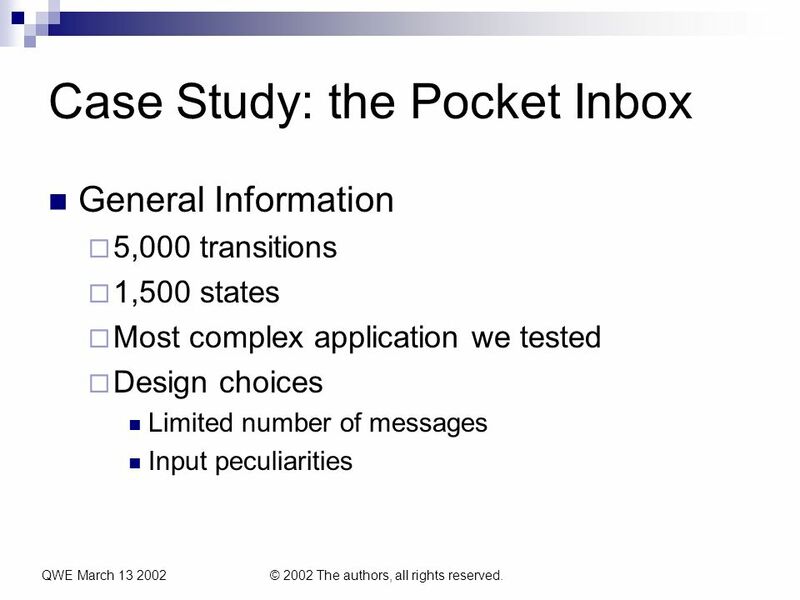 Experiences in Testing the Pocket PC. 3 QWE March 13 2002© 2002 The authors, all rights reserved. 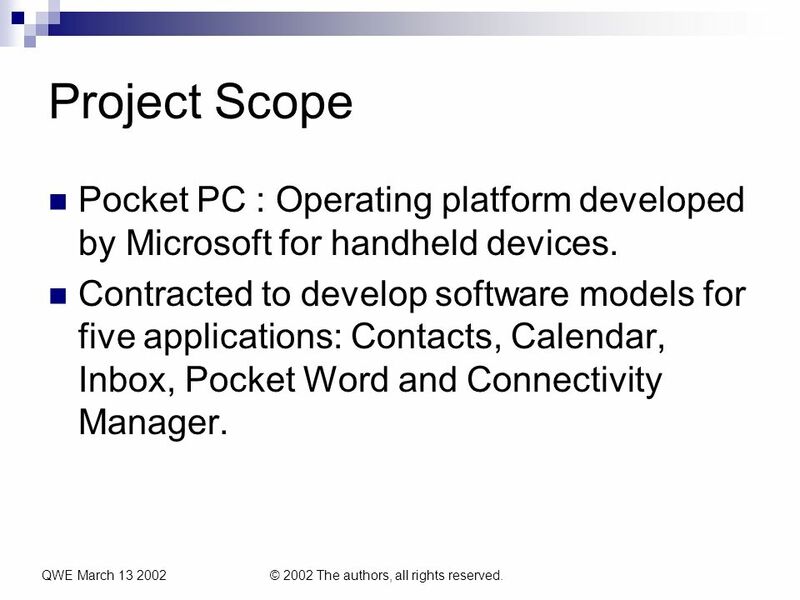 Project Scope Pocket PC : Operating platform developed by Microsoft for handheld devices. 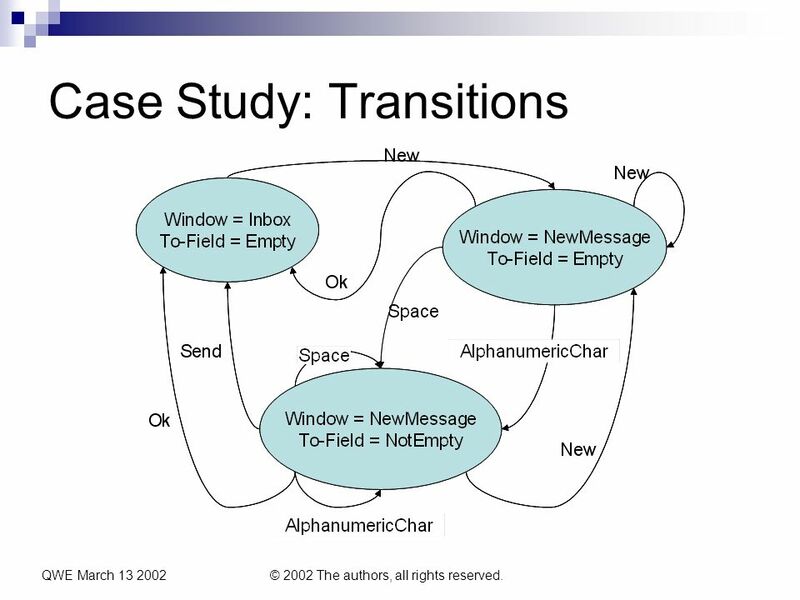 Contracted to develop software models for five applications: Contacts, Calendar, Inbox, Pocket Word and Connectivity Manager. 5 QWE March 13 2002© 2002 The authors, all rights reserved. 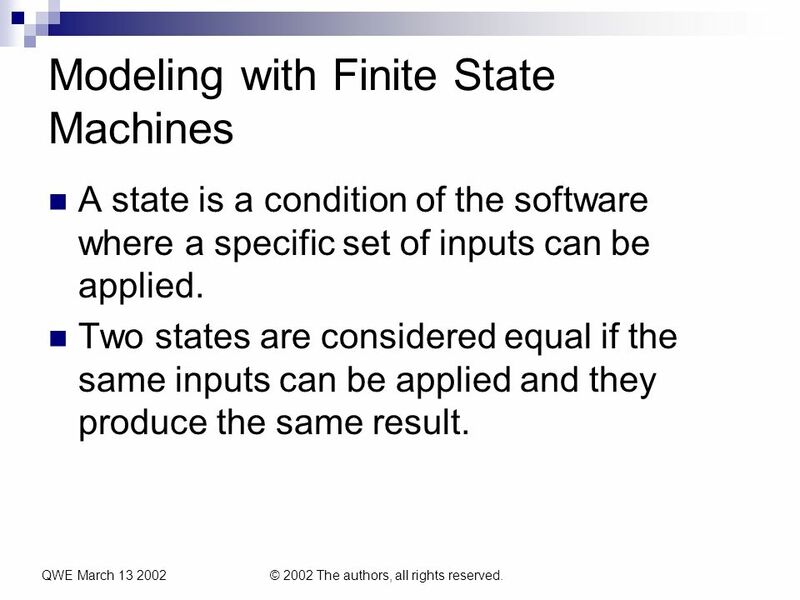 Modeling with Finite State Machines A state is a condition of the software where a specific set of inputs can be applied. Two states are considered equal if the same inputs can be applied and they produce the same result. 11 QWE March 13 2002© 2002 The authors, all rights reserved. 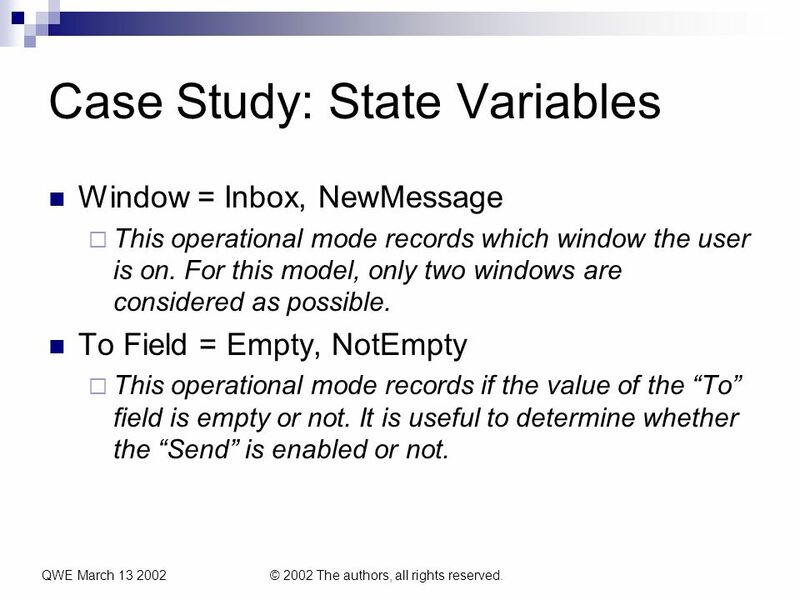 Case Study: State Variables Window = Inbox, NewMessage This operational mode records which window the user is on. 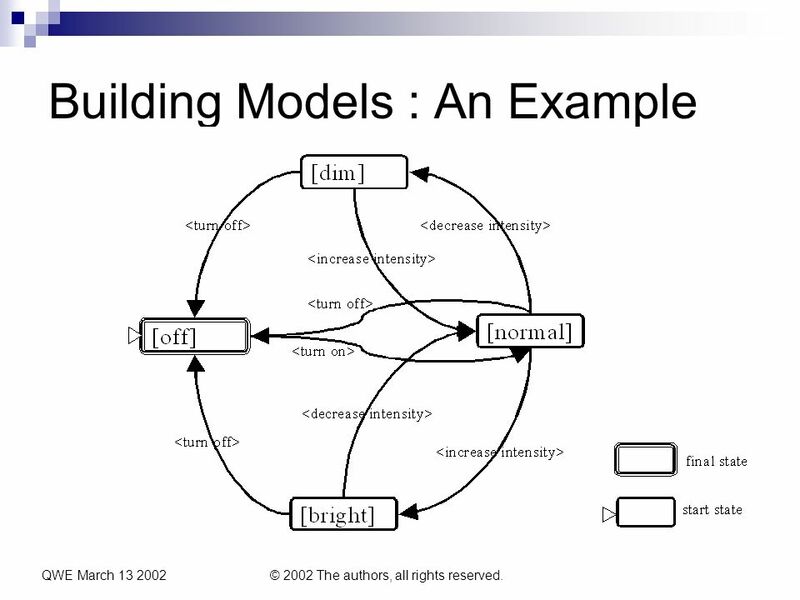 For this model, only two windows are considered as possible. 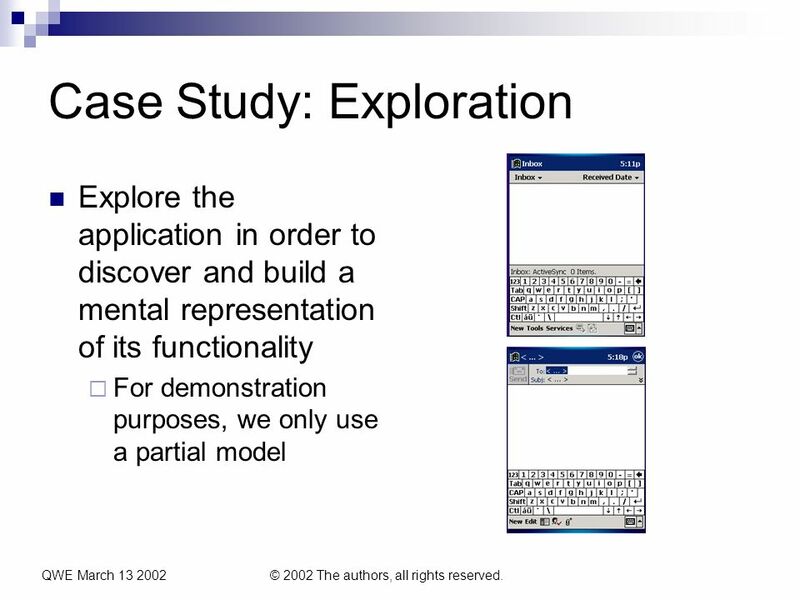 To Field = Empty, NotEmpty This operational mode records if the value of the To field is empty or not. 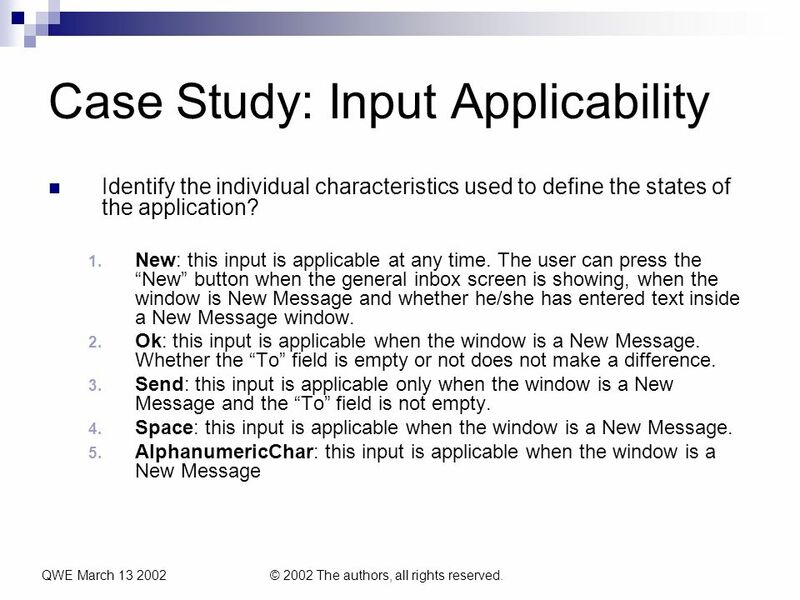 It is useful to determine whether the Send is enabled or not. 15 QWE March 13 2002© 2002 The authors, all rights reserved. 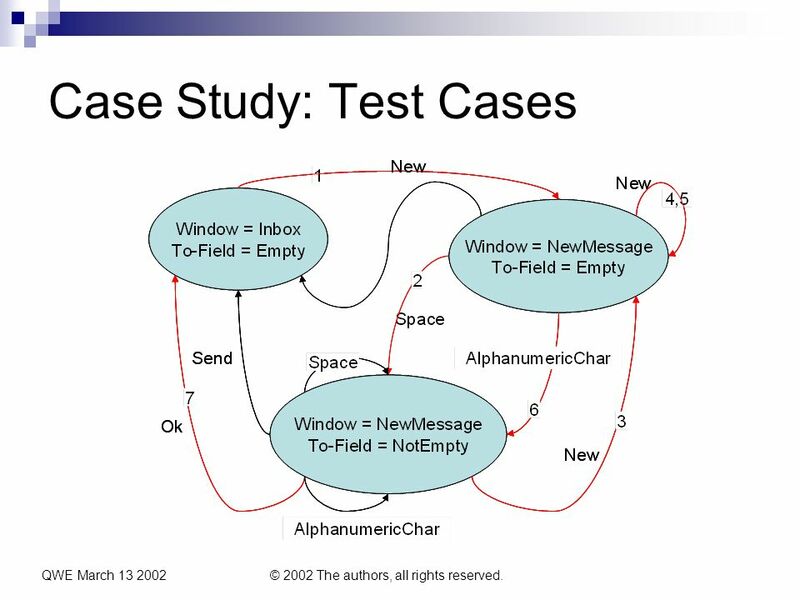 Conclusions Model-based testing needs to be coupled with exploratory techniques with the dual benefit of attaining a better, more current understanding of the system and harvesting many bugs along the way. 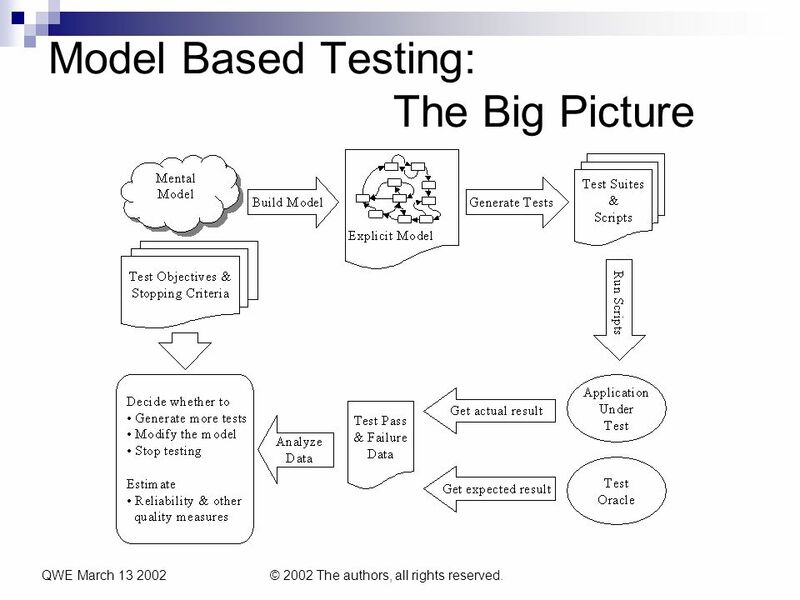 Models are beneficial, not only as a point of reference for testing purposes, but also as a living specification of the functionality it represents and as a basis for test automation. 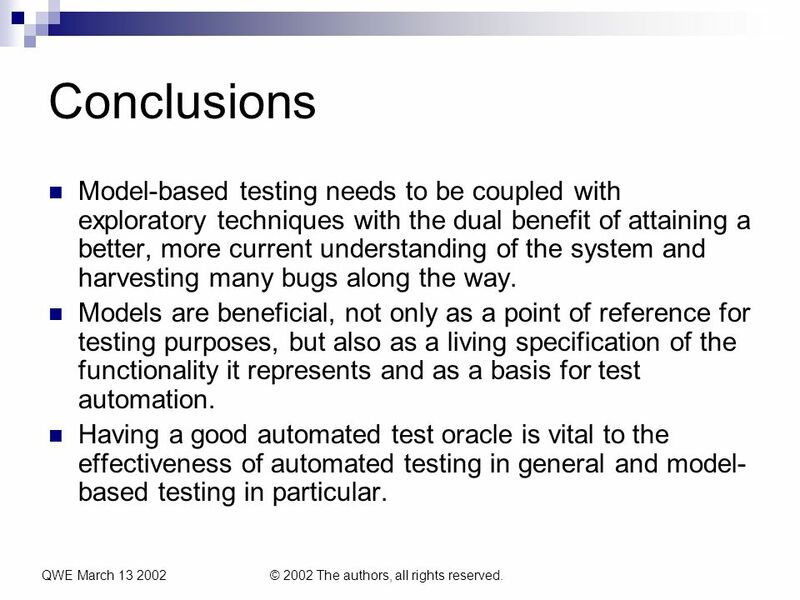 Having a good automated test oracle is vital to the effectiveness of automated testing in general and model- based testing in particular. 16 QWE March 13 2002© 2002 The authors, all rights reserved. 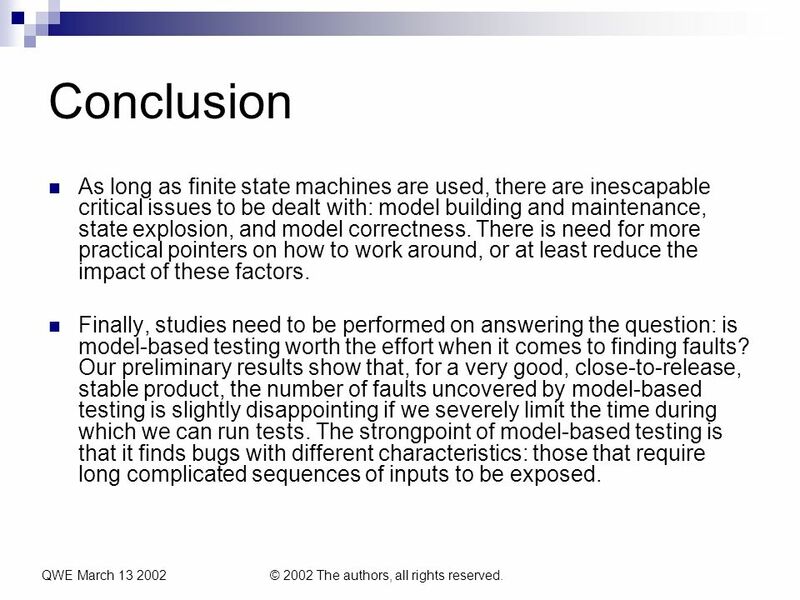 Conclusion As long as finite state machines are used, there are inescapable critical issues to be dealt with: model building and maintenance, state explosion, and model correctness. There is need for more practical pointers on how to work around, or at least reduce the impact of these factors. 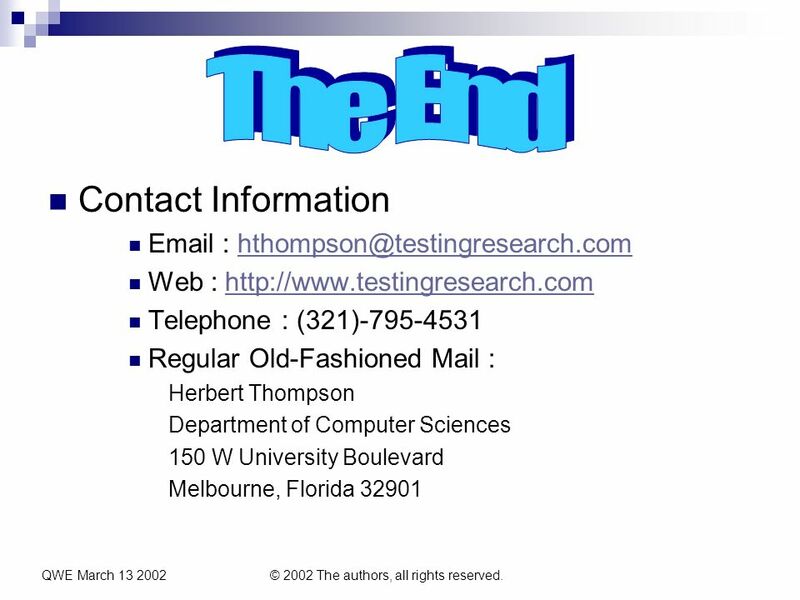 Finally, studies need to be performed on answering the question: is model-based testing worth the effort when it comes to finding faults? Our preliminary results show that, for a very good, close-to-release, stable product, the number of faults uncovered by model-based testing is slightly disappointing if we severely limit the time during which we can run tests. 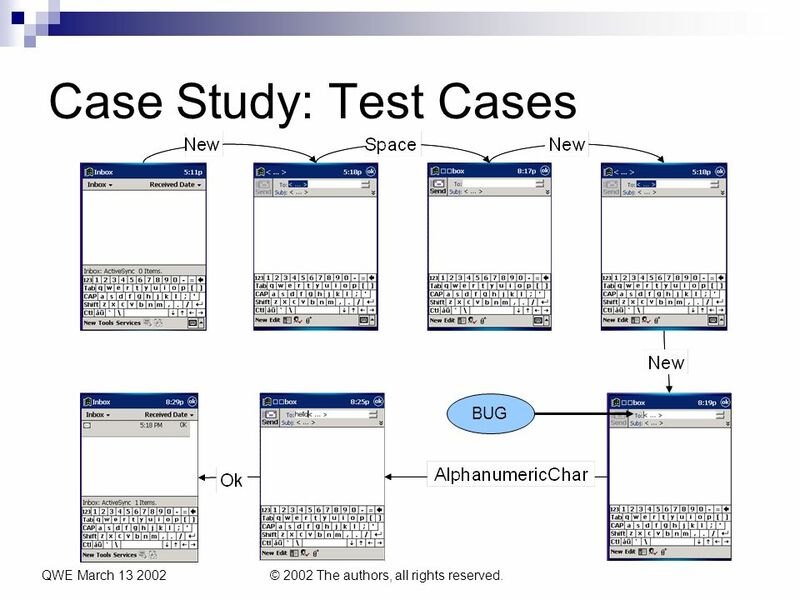 The strongpoint of model-based testing is that it finds bugs with different characteristics: those that require long complicated sequences of inputs to be exposed. 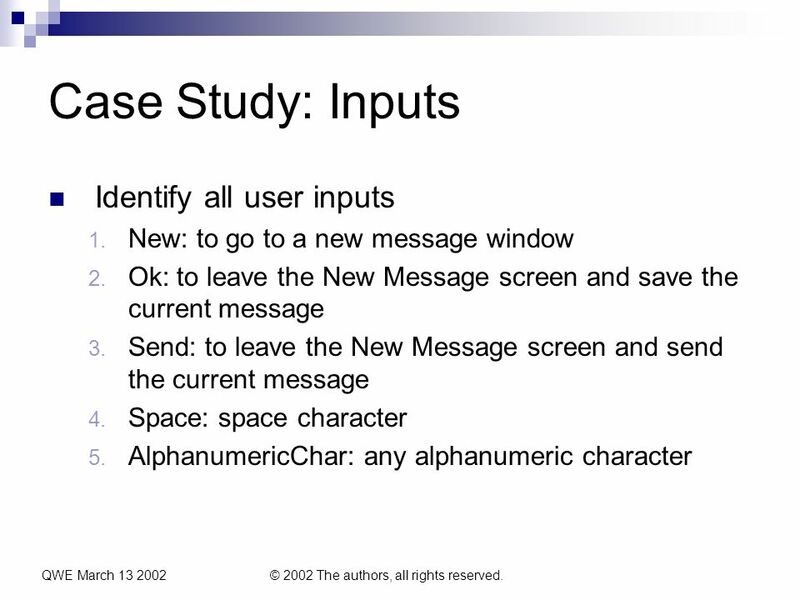 Download ppt "QWE March 13 2002© 2002 The authors, all rights reserved. 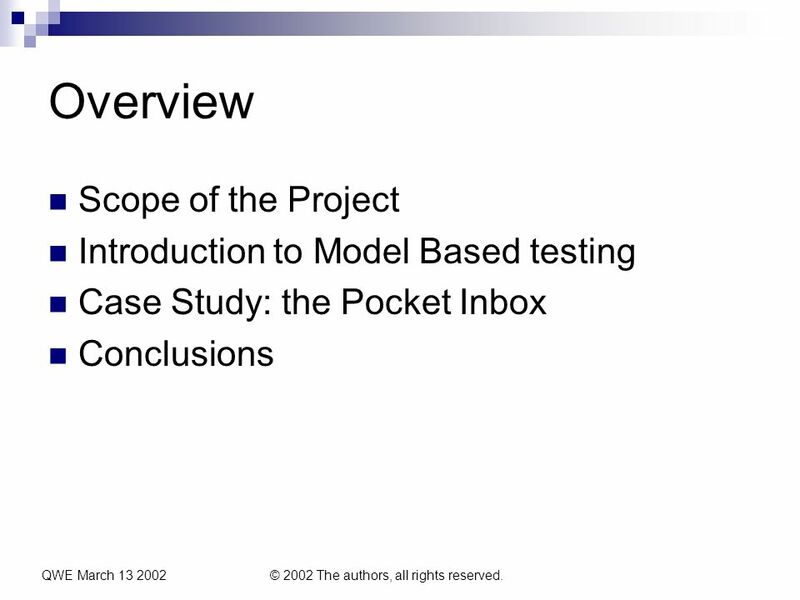 Experiences in Testing the Pocket PC." (c) Copyright 2002 Ibrahim K. El-Far. All rights reserved. Presented at Quality Week Europe Selecting an Appropriate Software Testing Method Ibrahim. Friday 6 September 2002(c) 2002 The Authors. All Rights Reserved.1 A Framework for Testing Wireless Applications Ibrahim K. El-Far Roussi Roussev Nattawut. Greg Sennema library.wlu.ca/blogs/technolibrarian Time Saving Shortcuts with Macro Express Greg Sennema Electronic Services Librarian Wilfrid. DCMS: Training Manual Help Desk Management July, 2010. Using Microsoft Office on the Pocket PC Nancy Clark, M.Ed. Director of Medical Informatics Education Florida State University College of Medicine. TCM Encounter Download Using MS Access For Import From a Block Text File. Welcome to Field2Base User Training. Founded 2002 in Raleigh, NC Software company with focus on automation of field communications 68 patent claims Certified. Using the Web-based Training Tool MyFloridaMarketPlace Revised Date: 12/14/06.